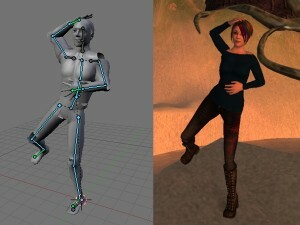 Tentacolor » Blog Archive » Tutorial: SL Animation for Blender Newbs! Tutorial: SL Animation for Blender Newbs! It’s done! I am pleased to present to you, SL Animation for Blender Newbs. It’s 6 pages long, with pictures. It might take you maybe 30 minutes or so to follow along, I’m guessing. If you have any feedback (e.g. suggestions or praise), leave a comment on any of the pages. Great Tutorial, fantastic exporter and tool. Is there a way to import existing animations (BVH files), and have it overlay or replace the existing bones of the tool for the purpose of editting existing animations? Yes, I’m aware you don’t support the tool *gryn*. Fantastic tutorial – and an awesome .blend file. I love the male/female avatars on separate layers; very nice touch. I’ve done some modeling in Blender, but this is my first foray into actually animating with it, so I appreciate the clarity of your tutorial – unlike many Blender tutorials I’ve seen, it doesn’t assume that the reader already knows where to find things or what the keyboard shortcuts are. My one suggestion is that newbies could benefit from a discussion of the hand_ctl and foot_ctl bones, and how to enable the constraints on the hands and feet to make use of them. They’re a great feature! However I have a problem…somehow in blender not all animations seem to ‘pick up’…like..part of the knees. I’m sure the figure keeps his feet on the floor and doesn’t mop it XD. I thought maybe it was because of not knowing what the feet ctl. L and feet ctl. R are…they are seperate chopped off phantomfeet! What can I do with this and how would they affect the skeleton? The feet and hand control bones can be used for inverse kinematics (IK). If you increase the scale of the control bones, the legs/arms will reach to try to match the position and rotation of the control bones.